Links are one of the most important ranking factors in Google' algorithms. While there is much talk about external links (links from other domains to yours) and a lot of effort (money and time) is spent on obtaining these, internal links on a website attract relatively little attention - for no good reason! Your internal links are a very powerful SEO tool and should not only be reduced to the navigation and the use of the keyword in the link text. There are large a number of big SEO success stories which were only possible thanks to clever internal linking strategies. 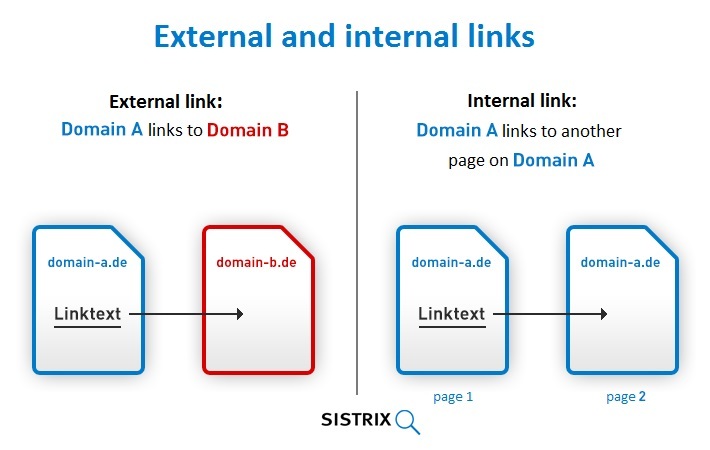 Some fundamental thoughts on the importance of internal links According to their own statements, Google has indexed 60 trillion individual pages on the internet with the help of their diligent bots. The Googlebot crawler requests individual pages and then follows the links on these pages. This way, it moves from page to page and saves the information found there on one of Google's servers. A large part, if not even the lion's share, of these 60 trillion pages are only accessible through internal- and not external-links. If we simply take a yellow pages directory for all of Germany, as an example, and look at the usual indicators, we will notice that – thanks to the 12,000 cities and municipalities and 3,500 industry-categories in the database – we can already create 42 million (12,000 x 3,500) localised category-pages. All of which have the opportunity to rank for at least 42 million different search-phrases (industry + cityname). Whether it actually makes sense to deliver all of those combinations is not a discussion we will get into, at this point. Even if we were to forgo half of the combinations, we would still be left with 21 million category-pages. And we have not even started talking about the detail-pages for the about 4 million companies or how we can include different neighbourhoods for the localisation. Even if we had an army of link-builders, we would still not be anywhere near being able to provide (with reasonable effort) each of these millions of pages with just one external (trustworthy) link. Other websites with similarly large databases, like shops, newspapers and so on, will likely fare the same. This is the reason why most sub-pages will not have any signals in the form of external links, which Google could use when calculating their rankings. Even small websites will often only have external links to specific parts of the site. In reality, we see a lot of sites manage to gain very strong rankings even without having external links. This is obviously a lot easier to do for the longtail than for contested keywords,but most keywords are part of the longtail and, in total, many pennies saved are quite a lot of pennies earned. I also know of a lot of additional examples where strong websites arrived in the top 10 rankings only thanks to their internal linking strategy (and good content). Now that we talked about “strong websites” we have nicely transitioned over to our the next subject, the external links. External links increase Google’s trust in the domain and the larger the trust is, the more will Google also trust your internal links. Due to this, both types of links are important and only through their interaction are we able to achieve complete success. External links are also necessary in order to get a large amount of pages into Google’s index. Having said that, it is simply too short-sighted to focus on external links only and treat your internal links like orphans. Regardless of whether you like to call it PageRank, link-juice, or link-love. Internal links will pass it along, just like external links. One thing you cannot increase with internal links, though, is the Domain-pop (amount of differnt domains linking to you). As soon as you have internalised this fact, you will also understand that, when it comes to the rankings, it makes a big difference if a page has 1-2 internal links or, for example, 100. A lot helps a lot. Naturally, internal links can pass on more link-juice, the more the websites manages to gain it through external links. Which is another line of thought that shows how necessary it is for both kinds of links to cooperate. The great thing about internal links is that you are absolutely free to do with them whatever you like. You can freely decide which link-texts you want to use and where. This does not only sound fantastic, it is fantastic. All the links you have ever wanted can be created as internal links, at least on your own domain. You also do not have to worry about any Google-filters. While the extensive use of hard money keywords (keywords for which you would pay a hefty price on AdWords) in the anchor texts of your external links will lead to a rapid loss of ranking, ever since the Penguin-Update, I am not aware of even one case where Google punished the use of money keywords in internal links (given that the content matches the keyword used). So, if the subject of the target page is “Adidas jogging shoes”, for example, it is absolutely reasonable to internally link that page with the link text “Adidas jogging shoes”, as often as you like. You are not in violation of any of Google’s guidelines by doing so. Sadly, most websites will only inadequately exhaust this opportunity. The top 100 in the SISTRIX Visibility Index is presided over by wikipedia.org, by a huge margin. And I am sure that every internet-user will agree that it feels like you get a Wikipedia result as one of the top 3 results for at least every second searchquery you start. So what is Wikipedia doing? For one, there are no advertisements on the site and they have (relatively) good content and then there is their internal linking strategy, where they use hard money keywords like you wouldn’t believe. If the word “marketing” appears anywhere in a Wikipedia article, they link to their marketing article. If the word “credit card” shows up, the credit card article is linked to, and so forth. I am certain that, initially, Wikipedia did not choose this type of link strategy to improve their rankings. It is much more likely that the folks at Wikipedia believed that this kind of internal linking is easy to understand for visitors and makes for good usability. Either way, the links work great, as far as Google is concerned. And now that we are at “keeping the user in mind” we are already at our next topic. What is the optimal link and what kind of links do I want to have? These and additional points can also be found in the Google Patent “Ranking documents based on user behavior and/or feature data.” In the patent specification, Google describes their idea that links, which are clicked on more often, should be more valuable and therefore pass on more link-juice. You can find a good summary of the patent on SEO by the Sea. While it is often very difficult to get such links from external websites, you can fashion your internal links exactly after the above criteria and you should really make abundant use of this. Not only do these links improve your rankings with Google, they actually make your website more attractive for users. Both SEO- and user-orientation work hand in hand. Everyone who believes that this strategy may work for Wikipedia but not for their own website should take a look at other websites with a high Visibility Index score. There are a large number of additional examples, from a wide variety of industries, within the Top100 SISTRIX Visibility Index list, where the abundant use of internal links shows to be a boon for both the search engine optimisation as well as the website usability. If you take a closer look at some of these examples, you will notice that these internal links are partly the reason why the websites are very convenient and user-friendly. I am sure that you can already think of more than one way of how you could use such a systematic internal link strategy, that is also helpful for users, for your own website. When you check out the above examples and recall the sentence “The more real users actually click on the link, the better it is.“, it should become quite clear how you can optimise your internal links. It is not user-friendly to just offer a standard navigation next to or above the content. The user’s gaze has to leave the content and orientate itself anew on the website. This will inevitably be the cause for a loss of a large part of visitors. Create a second navigation within your content through the use of internal links, so that users do not have to direct their focus away from the content. Offer those links to the user within the text, which are the next logical click for them. This could be additional information, explanations, filters, similar articles, overviews, and much more. Both your users and rankings will thank you for it!